With the basics out of the way, it’s time to talk enhancement. These products may not have made the ‘essentials’ shortlist, but they are no less important in creating spectacular looks. Discover different textures and colours, and build up your cosmetic arsenal with these beauties, each designed to add a little extra something to your make-up routine. The starting point for all make-up. A good primer will smooth and refine the upper surface of the skin to create the perfect base for your foundation. The barrier effect of the formulation will help your make-up to last longer, and keep skin moisturised and comfortable. Try a tinted primer to even out a discoloured complexion. These are normally available in a range of colours to counteract colour in the skin, such as a green tint to counteract reddened skin, or a pink tint to add vitality to a sallow complexion. 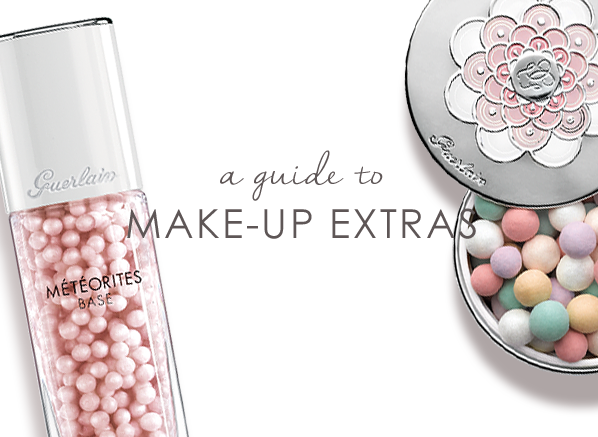 Whether pressed or loose, powder is a great way to set make-up once it has all been applied. It is a fabulous mattifier for oilier skins, absorbing excess moisture when applied to give the appearance of a flawless complexion. Load some product onto either a large brush or a puffer, and diffuse sparingly all over the face. Bronzer provides a sun-kissed glow in an instant. Can be used to sculpt the face across the forehead, cheeks and nose – places where you would naturally catch the sun. Most commonly available in a powder formulation, a bronzer is an easy way to achieve a healthy, glowing look. Highlighter provides an instant radiance with the help of pearlescent shimmer and light-diffusing particles to control where the light hits the face, in turn helping to sculpt it. Normally available in a pen format, highlighters can be swept along the cupid’s bow of lips, the brow line, down the centre of the nose, along the cheek bones and in the corners of the mouth to infuse your skin with a perceptible glow and a seemingly natural luminosity. Eyeliner is available in either a pencil or a liquid format. Liquid liners are normally ‘tightlined’ in a thin, clean line traced close to the lashline, whilst pencil or kohl liners are more pliable and ‘blendable’, to create a smokier look. Pencil liners can also be applied to the ‘waterline’ – the inner rim of the eyelid – to create a sultry intense eye. Eyeshadow is possibly the easiest and most diverse way to introduce colour into your make-up palette. Whether cream or pressed powder, sheer or highly pigmented: shadow is one of the most versatile of all make-up products. It can be blended, shaded and graduated in an infinite number of ways and can be bought in almost any shade imaginable, making it an extremely covetable product. This entry was posted on Monday, January 10th, 2011 at 2:42 pm and is filed under Make-up, Make-Up, Shopping Guides. You can follow any responses to this entry through the RSS 2.0 feed. You can skip to the end and leave a response. Pinging is currently not allowed.